Yummy Gummy Molds gives families the highest-quality BPA free and LFGB/FDA approved silicone bear mold so it is EASY and FUN for families to create healthy & delicious cute bear-shaped treats. These uniquely detailed 1 inch bears are custom-designed to be larger so they easily pop out of the silicone mold. Enjoy making and eating your cute and tasty bear creations! LARGER UNIQUELY DESIGNED 1 INCH BEARS: Have fun creating larger cute and detailed gummy bears with happy faces and a cute bowtie. Easily pop them out of this non-stick gummy mold. 100% BPA FREE & LGFB/FDA APPROVED SILICONE: Only the highest quality silicone is used so gummy molds are guaranteed to pass the "pinch test." Safe and durable for freezer, refrigerator, oven, microwave, and dishwasher. Able to withstand temperatures between -40 to 450 degrees Fahrenheit. MAKE A VARIETY OF TASTY HOMEMADE TREATS: Get creative! 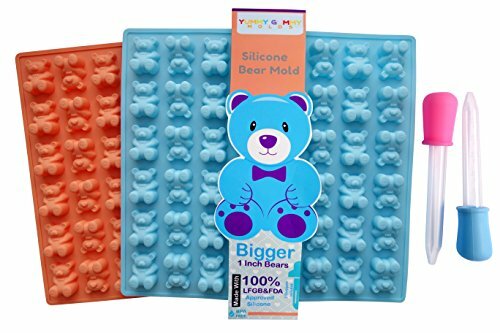 Whether it's homemade gummies, nutritious gummy vitamins, yummy chocolate bears, or bear-shaped ice cubes, this silicone candy mold is versatile enough to make many different tasty treats. 2 BONUS DROPPERS TO FILL 2 GUMMY MOLDS QUICKLY: Use 2 droppers to quickly fill each bear so you can easily make and eat your tasty creations sooner! BONUS recipe included. FUN AND EASY WAY TO MAKE HEALTHY GUMMY BEARS: This specially designed gummy mold is easy to use so you can spend your time having fun with your family to create cute, delicious, healthy gummy bear snacks the whole family will love eating! If you have any questions about this product by Yummy Gummy Molds, contact us by completing and submitting the form below. If you are looking for a specif part number, please include it with your message.